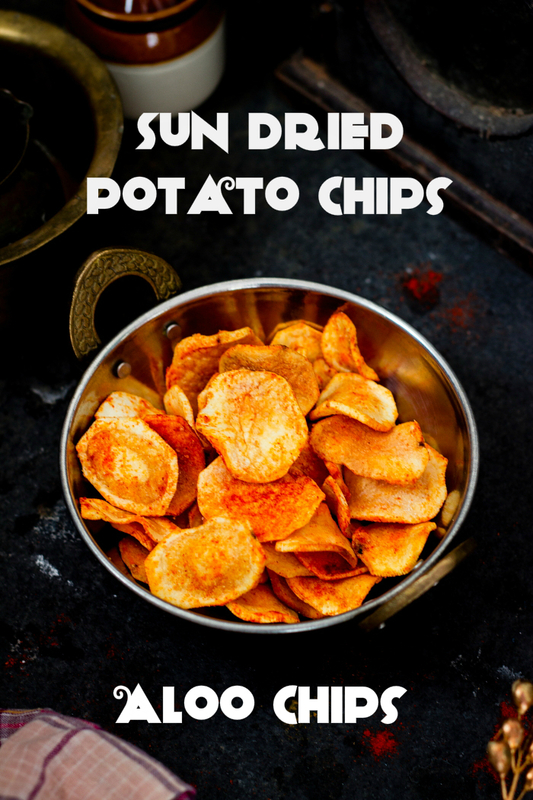 Sun dried Potato Chips - potato slices that are dried in the sun and then deep fried and tossed in seasoning. Highly addictive!! The Sun dried Potato Chips are the BEST, seriously guys!!! Who doesn't love potato chips? I'm sure even the Victoria Secrets models who are eternally on a diet wouldn't mind sneaking one in, once in a while. There are so many varieties of potato chips or crisps or whatever else you might want to call them, but I assure you, this is the best. Cause of course, you will make them yourself. And tell me if I'm wrong, but anything homemade tastes so much better than the preservative loaded air filled packet stuff. Recently, I was reading this really old article on Reddit about what surprised non Americans when they visited the USA, I was definitely surprised with the vastness of the country and the enormous food portions. But something that definitely got me crazy was the size of the Potato Chips packets. I think they are as tall as toddlers. Why are they so big? Are they meant to be family packs? If yes, how large is this family? Don't people get bored of the flavor after going through quarter of the packet? Or is it meant to last a month? I did not get that at all. I went a little nuts over the number of flavors though, you get every flavor under the sun. Back to the Sun, that's really the focal point today. Did I tell you how the Sun cheated us this year?We had the shortest summer ever, just ONE month. Just April. Summer came and went in the blink of an eye. 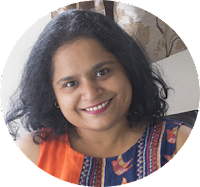 Summer gets replaced by Monsoons in this part of the world and then everyday is just a dull cloudy day dotted with spells of rain. Usually, I'm a big fan of the rains, I simply love how everything turns bright green, and that fragrance when the rain hits the earth is simply divine. And rains, means deep fried deliciousness and loads of hot cups of chai. But this year I was a little disappointed. I had so many things planned for Summer, and I could barely scramble them in, in a month. But what I did manage to do , was sun dry some potatoes. You may have only heard of sun dried tomatoes, but believe me sun dried potatoes are even better!! And people have been doing it for ages, just not me though. This was my first and definitely not my last attempt. Potatoes barely take 3-4 days to dry and the drying makes them intense and all the more potatoey (if that were a word). STEP 1 - Wash, peel, and slice the potatoes. STEP 2 - Soak the slices in salted boiling water until they are just about done. STEP 3 - Lay them out on a cloth to dry in the sun. STEP 4 - Deep fry them and toss them in salt and chilli powder. Step 4 can be done months later. The chips can be stored for 3-4 months easily if stored in a clean dry air tight container. The good thing here is, you can decide how much to fry, you don't need to fry the entire batch at once and worry about them going soft, however, I assure you, that is not a problem, coz like all potato chips, these are irresistible. 1) Do not slice the potatoes very thin like you would for regular chips. These need to be around 2mm. 2) As you slice the chips, put them in water so they don't darken due to oxidization. 3) The chips are soaked in boiling water until they are just about done. If you take them out too quickly, the chips will darken while drying. If you leave them in there too long, they will be completely cooked. So you need to drain them out in 5-8 minutes. Squeeze a chip in between your thumb and index finger and the chip should give when you apply a little pressure. If it does not, it still needs to be cooked, if it gives too soon, it is overcooked. 4) Dry on a cloth, not a tray or plate or paper. The chips will stick to whatever you have placed under it, and removing them from a tray or paper can be difficult. Preferably, use a white cloth or a light colored one as you don't want color running onto the chips. 5) If the chips turn black on the edges or in small spots, you can still use them, just make sure these are the ones you fry first. 6) If you don't have enough sun, place them in the shade, they will dry there as well, but will take much longer. And last, you can flavor these chips with whatever flavor you like - curry, mint, oregano etc. Just do it immediately after frying while the chips are still hot so the flavor sticks to them. Or you can just salt them and enjoy the potato flavor to its maximum. 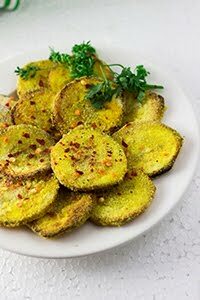 Potato slices that are sun dried and then deep fried and tossed in seasoning. Slice the potatoes to about 2mm thickness and immerse in water to prevent them from browning. Boil water in a large pot, add salt. Once it comes to a rolling boil, lower heat and add the potato slices to it. Boil for 2-3 minutes then turn off the heat. Let the potato slices soak for 5-8 minutes. Squeeze a slice between your thumb and index finger and it should give slightly after you apply a little pressure. If it does not, allow it to soak longer. If it gives too quickly, it has overcooked, remove from water immediately. Drain the potato chips and lay them out on a white cloth in the sun. Cover with a light muslin cloth to prevent dust from settling on to the chips. You can dry them in shade as well. Leave it in the sun for 3-4 days or until completely dried. Store in a clean dry air tight container. It can be stored for 3-4 months. 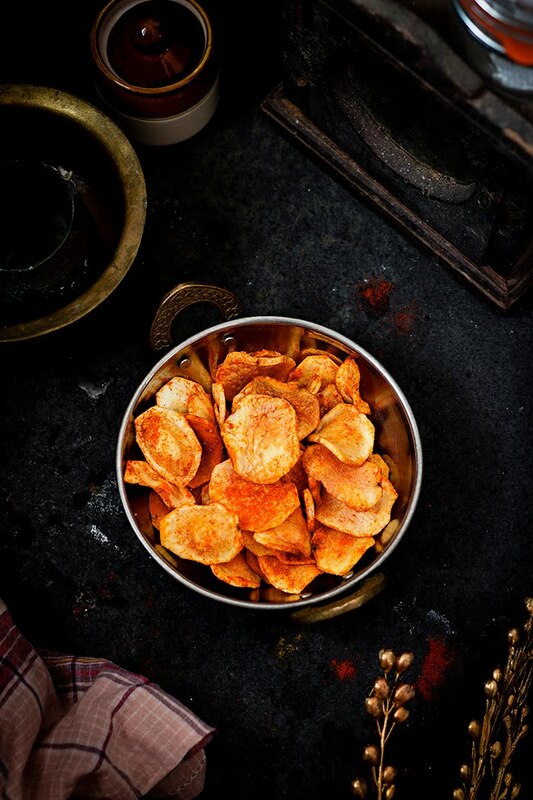 When you want to eat the chips, deep fry them and toss with salt and chilli powder immediately.